Moving definitely has a way of making you re-consider the value of your possessions. We have just moved from a six bedroom rented mansion into a three bedroom shoebox with my mother and brother. That’s four adults and three kids squeezed into three little rooms, all in the name of saving for our Airstream Adventure (thanks for putting up with us Mum). Five truckloads of boxes and furniture were dropped off as I juggled exhausted babies and tried not to hyperventilate. Five. Truckloads. Most of which is still sitting on the verandah. There is no way even half of it will fit inside this little house. Right now, I just would love to drop every unpacked box off a cliff. Where did all this junk come from? I feel overwhelmed and really pissed off that we, well mostly I, have managed to accumulate so many things. We need to downsize dramatically. As I unpack, I’m trying to cull. In the back of my mind is the fact that in less than one year we will be living in a 28 foot Airstream and I won’t miss 99 per cent of all this stuff. The road to reducing is proving to be a long one. This is just one of five truckloads of our possessions and we don’t consider ourselves overly consumeristic. Our two year old was distraught when she saw her empty room. This image really breaks my heart. How many of us unknowingly corrupt our children by giving them so many “things”? When we sold our house, our oldest cried cried too. Saying good-bye to her room and her house crushed her. But we’ve now been in our Airstream for over 4 months and she doesn’t mention it all. But man, that moment was tough. Yes it was awful. She still talks about her “old” house. But I’m hoping once we hit the road and chase the sunshine she will be too busy enjoying the sun and sand to care anymore about bricks and mortar. Thanks so much for your message. I will definitely start following your adventures on the road. 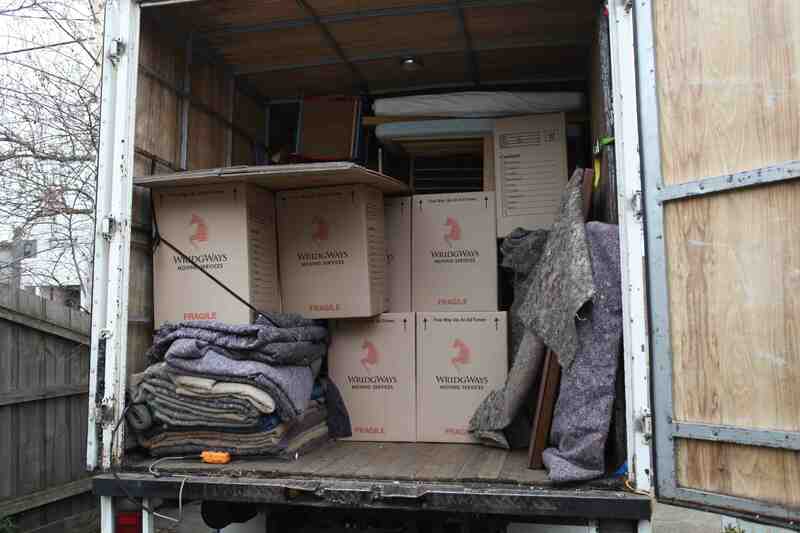 When we left USA to return to Australia some 17 years later (just 1 1/2 yrs ago) we reduced from an office and 2 condos all filled with furniture and stuff down to 63 boxes. I couldnt have done it without all the family and friends that just kept makiing me make a decision – take, toss, sell or give. It helped that some of my favorite stuff went to favorite people and I know they think of us often because our stuff in in their presence. It is liberating and really makes me stop and say do i really need that. in the past year and half what I have spent money on is mostly consumables and of course a bedroom set. But that is it!! very freeing!